Diagnosis: Colony thinly calcified, forming encrusting sheets, or free-living, lunulitiform, anchored by basal rhizoids. 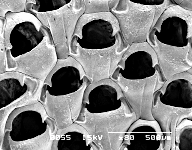 Zooids with extensive gymnocystal frontal, with minute oral cryptocyst embayments and small, proximal costal areas. Avicularia absent. Ovicells large, immersed, sometimes kenozooidal, with uncalcified frontal windows.